(Athens,GA) – Though the mercury may deceive you, autumn is upon us. 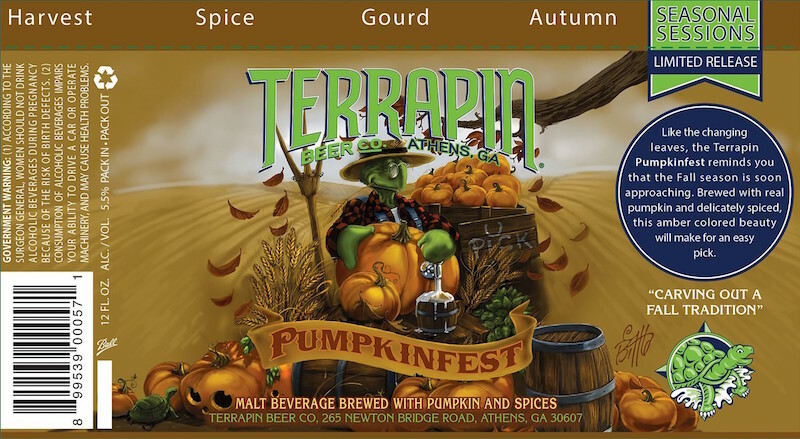 With hopes to entice the cool, crisp breezes and brilliant colors of fall to arrive a bit quicker, Terrapin Beer Co. has released Seasonal Sessions fall favorite, Pumpkinfest. Pumpkinfest will have you fall for Terrapin all over again. Like the changing leaves, the Terrapin Pumpkinfest reminds you that the fall season is soon approaching. Brewed with real pumpkin and delicately spiced, this amber-colored beauty will make for an easy pick. Other: Cinnamon, Ginger, Allspice, Cloves, Nutmeg, Pumpkin!! Pumpkinfest is available in 6-packs of 12 oz. cans and 1/6 BBL kegs, and is now on shelves throughout Terrapin’s distribution network. Terrapin Beer Co. has a portfolio of six year-round beers, four Seasonal Sessions beers, the Monster Beer Tour collection of four high-gravity selections, and the Side Project series of one-time releases. Terrapin co-owners John Cochran, President, and Brian “Spike” Buckowski, Brewmaster, have developed a reputation for high-quality beers that push the boundaries of creative brewing. Terrapin Beer Co. is open to the public for tours every Wednesday – Sunday with live music and tastings; please see our website for hours of operation. The brewery is located at 265 Newton Bridge Road in Athens, GA. The tours are an excellent opportunity to taste Terrapin’s full line of award winning beers at their freshest and to see the brewing process first hand. For more information visit the website or Facebook page.